Manama: Kuwait on Thursday asked the Iranian embassy to reduce the number of its diplomats from 19 to four, reports in the northern Arabian Gulf state have said. The diplomats, declared personae non gratae, were given 45 days to leave Kuwait. The request was made in a protest letter to the Iranian diplomatic mission in Kuwait, asking for shutting down the cultural mission and the military bureau and announcing that all joint commissions between the two countries were suspended. The Kuwaiti moves were made following the conviction of the members of Al Abdali terror cell who were put on trial for their intelligence contacts with Iran and the Lebanese pro-Iran militia Hezbollah, Kuwait News website reported. Kuwait News Agency (Kuna) reported the request to reduce the embassy staff, the closing of the cultural mission and technical offices and the suspension of joint commission activities. On August 13, 2015, Kuwait’s Interior Ministry said that it busted a terrorist cell and uncovered a large cache of arms, ammunitions and explosives hidden underground at a farm in Abdali. The cache contains 24 hand grenades, 65 guns, 56 RPGs and 144kg of bomb-making material. It said that 24 defendants faced charges of engaging in acts likely to undermine the unity and safety of Kuwait and of intelligence with Iran and Hezbollah. However, the Iranian embassy on September 3 downplayed the significance of the terrorist cell and the charges of espionage, saying that the case was a domestic Kuwaiti issue pertaining mainly to the discovery of weapons and ammunitions. The embassy said it regretted the move to implicate Iran in the case and called upon the Kuwaiti authorities to communicate the identity and “alleged role” of the Iranian suspect. On Saturday, Iran’s Parliament Speaker Ali Larijani dismissed the Kuwaiti charges as senseless. “Accusing Hezbollah of being implicated in the Abdali cell does not indicate rationality or wisdom,” he said. “It stems from the hatred against the party,” he said n.
However, Iran’s remarks were rejected by the head of the then Kuwaiti parliament’s interior and defence committee MP Abdullah Al Maayouf. “Iran must tend to its own domestic affairs instead of interfering in those of others,” he said, accusing Iran of killing and torturing opposition members including politicians, chancellors, doctors and university professors who objected to forgery in the Iranian presidential elections. Al Maayouf accused Tehran of hosting terrorists and supporting terrorist organisations and working to destabilise countries in the region. “Reason up”, he urged the Iranian government, calling for more wisdom to achieve regional stability and peace, the daily said. 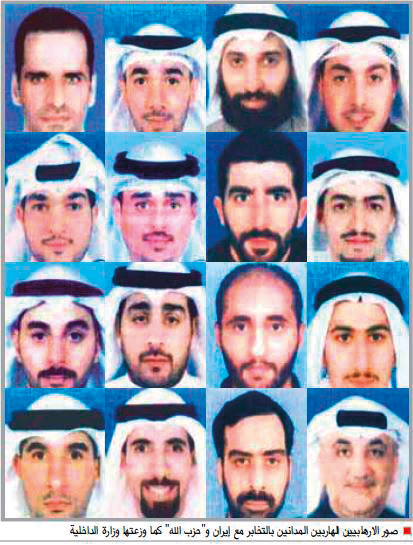 The Kuwaiti cabinet voiced “deep indignation and condemnation over the heinous acts and grave charges” revealed by the indictment of 26 people for the illegal possession of arms and contacts with Iran and Hezbollah. “The charges involve dimensions and risks that pose a threat to the nation’s security, sovereignty and stability, as well as to its unity and territorial integrity, particularly in light of the huge amounts of explosives, arms and ammunition seized by the security bodies last month, and the way they were hidden,” the cabinet said. The cabinet stressed that it would never tolerate targeting or harming Kuwaiti citizens and expatriates and that all the concerned agencies would take the necessary measures to preserve security and safety in the country. The trial opened on September 15, 2015 and the criminal court on January 12 ruled death sentences for the Iranian in absentia and for a Kuwaiti defendant. It also decided a life sentence for one suspect and prison terms for the others ranging from five to 15 years. The verdicts were appealed and the Court of Appeals in July last year ruled that 15 members of the cell were not guilty in the case of espionage for Iran and Hezbollah. In June, the Cassation Court overturned the death sentence of one accused and commuted it to life in prison. It also cancelled the acquittal of 15 defendants and sentenced two to 15 years in prison, 15 to 10 years and three to five years. On Monday, Kuwaiti daily Al Siyassah said that 14 Al Abdali Cell convicts on June 18 fled to Iran after they used small boats to reach international waters where an Iranian vessel was waiting for them. The Ministry of Interior on Wednesday said there was no evidence that the convicts had left the country and appealed for assistance from Kuwaitis and residents in locating them. The ministry warned that anyone withholding information on the whereabouts of the convicts would face legal measures. The warning was issued following Al Seyassh report that some of the convicts disappeared on the day the Cassation Court, the highest court in the country, overturned an acquittal ruling by a lower court and ordered their imprisonment. In its statement, the ministry urged anyone with information on the criminals to come forward. “We call on all citizens and residents to cooperate with security forces and provide any information they may have,” the statement said.